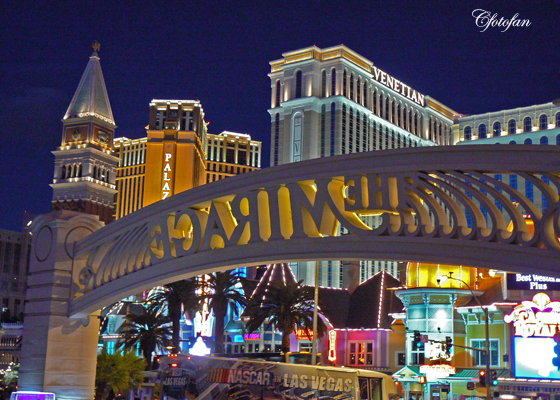 The Boulevard leaves the city of Las Vegas at Sahara Avenue and assumes its unofficial name the Las Vegas Strip for the next 4 miles (6.4 km). This portion of Las Vegas Boulevard begins a few blocks to the north at the Stratosphere (the only major Strip hotel/casino actually sited within the Las Vegas city limits) and runs past Mandalay Bay ending at Russell Road. This is the section of the road most people are familiar with; it is home to casino megaresorts with their world famous lights, huge video signs and other attractions. It is designated as an All-American Road. Just past the end of “The Strip”, the road passes the Welcome to Fabulous Las Vegas sign (located in the median) as it abuts the western edge of the McCarran International Airport property. The “South Strip” is now used to describe the section of Las Vegas Boulevard between Russell Road and Blue Diamond Road (which was recently relocated to intersect at Windmill Lane). Along this stretch, development thins out except for newer shopping malls, hotels and condominiums as the Boulevard continues to travel south, just to the east of Interstate. This entry was posted in captures, diversión, fotografías, fotos, fun, gallery, Images, imágenes, photos, pictures, travel and tourism, turismo and tagged Las Vegas, Las Vegas Boulevard, Nevada, Vegas. Bookmark the permalink.